Our family home is on the best street in Leigh with gorgeous sea views from almost every room, perfect for large groups/multiple families with a 3 bedroom home upstairs and self contained 2 bedroom apartment underneath if you wish to book that as well. 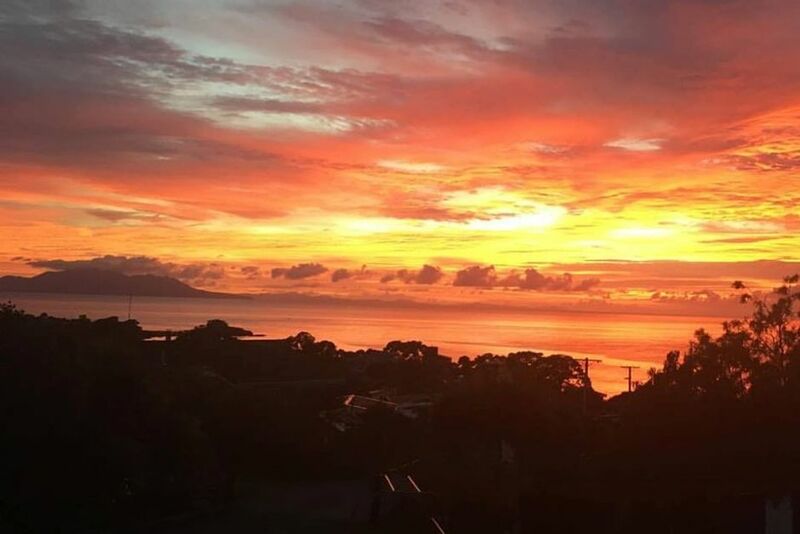 The house is the perfect place to stay and explore the sights of the Matakana Coast including Goat Island, the Marine Discovery Centre, Pakiri Beach, Matheson Bay, Leigh Coastal Walkway, Leigh Sawmill Cafe, Leigh Eats, Sawmill Brewery, Matakana cinema and markets, etc. Plenty of space for large groups and well set up to enjoy morning coffee on the front deck overlooking Little Barrier or cocktails on the back deck with lovely sea and bush views. Book just the upstairs for only 6 people or the entire place if you have a group of 10. No Parties; excess noise after midnight not permitted! No smoking at this property please! Apartment and master ensuite currently being completely renovated. The location is great, close to the beach and Goat Island. The property was perfect for our large group of extended family. The house is great for families and groups - it's got so many great elements to it - lovely homely lounge area, very well equipped kitchen, comfortable bedrooms, a balcony with an amazing view at the front and a spacious and practical deck out the back. Great location with plenty of great places to visit around and nice and quiet when you're staying at the house - we're definitely looking to go back and stay again! Thanks Tony! You said you were coming to hang out with friends and cook and that's exactly what you did. We appreciate how considerate you were to the neighbours and how well you looked after our house. We booked this place for 7 days over the New Years period and it was fantastic. We booked this place for 7 days over the New Years period and it was fantastic. Megan was so easy to deal with leading up to the stay and during. The view and location is beautiful, we would highly recommend! Thanks Hollie, so glad you enjoyed relaxing at our place over the holidays!